Premier League Underbank Rangers from Holmfith travelled to Northwest Counties side Orrell St James for the sides’ fixture in the opening round of the Coral Challenge Cup. Fifty-two sides were in the hat all hopeful of progress, including Red Star Belgrade who will begin their campaign on Sunday afternoon. Underbank opted to play down the slope in the first half, in good, if slightly breezy, weather conditions, as they looked to establish an early advantage. After plenty of early pressure from Underbank, Alex Chatterton opened the scoring after a penalty close to the line as he took a short pass and dived over the line. Luke Pogson was unable to add the conversion from wide. The early signs were not good for the home side. On thirteen minutes the home side were level when Danny Pyke picked up a pinpoint Jake Davies grubber kick under the sticks to ground unopposed. Pile added the conversion for 6-4. After gaining a penaty for a head high tackle, a delightful drop of the shoulder from Luke Pogson saw him outpace the Orrell defence to restablish the visitors lead on twenty minutes. Pogson added the conversion for a 10-6 lead. On twenty-six interference at the play-the-ball allowed underbank to work the line with Owen Restall going through a gap to score. Pogson added the conversion for a 16-6 lead but it was a good showing from the lower league side who weren’t just rolling over and who avoided further points until the interval. Alex Chatterton made the most of a 40-20 when he went over for his second of the afternoon. There was some controvery over the decision but Underbank weren’t hanging around as Pogson added the extras for 22-6, the Yorkshire side heading into the next round. A Pyke penalty reduced the arrears by two but as the rain intensified, and conditions worsened, Andy Boothroyd broke the line and found Alex Chatterton in support to go over for his hat-trick try. Scoring under the uprights gave Pogson a simple conversion for a 28-8 lead with fifty-five minutes on the clock. Sam Lewes grabbed one back for Orrell with a carbon copy try of their first, a grubber to the sticks collected and grounded by the loose forward. Pyke added the conversion to bring up double figures for the home side after an hour. A mass brawl followed a lifting offence wuith referee Jones taking reportrs from her touch judges before sin-binning Pogson and O’Mara. After receiving a penalty for back-chatting, Hanley Turner took over the kicking duties with Pogson in the bin but was unable to add the two points. On seventy-eight Turner did find the target with another penalty for a 30-12 lead. 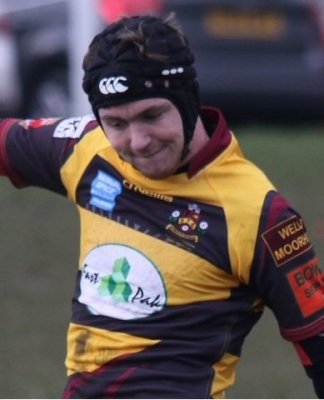 While there were moments for Orrell the result was never really in any jeopardy for Underbank as the Premier League side cruised through to the second round. Conditions in the second half were atrocious for both sides but they still managed to serve up a gritty game, very capably refereed by Tara Jones. Orrell St James: McHugh, Roby, O’Mara, Grimshaw, Fleming, Pyke (T, 3G), Davies, Marsh, Houghton, Molyneux, Lavin, Kennedy, Lewes (T). Subs: Mosley, Ellis, Riches, Wilson. Underbank Rangers: Garside, St Hilaire, Chatterton (3T), Stringer J, Allette, Knight, Pogson (T, 4G), Booth, Hirst, Robinson, Broadbent-Allan, Restall (T), Moorhouse. Subs: Turner (G), Stringer T, Eidson, Boothroyd.